We’d love your help. Let us know what’s wrong with this preview of Tinseltown Riff by Shelly Frome. Tinseltown Riff centers on Ben Prine, a thirty-something hack screenwriter who, on a Labor Day weekend, finds himself in desperate straits. Latching on to a dubious last-minute opportunity, he unwittingly embarks on a collision course with a Montana tracker connected with a Vegas mob; an odyssey which culminates in a fateful showdown on an abandoned Western movie set. To ask other readers questions about Tinseltown Riff, please sign up. 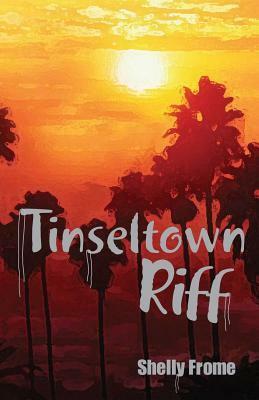 I just love the cover for Shelly Frome’s TINSELTOWN RIFF! It’s a perfect fit for a book set in Hollywood and about a screenwriter trying to catch a break. The writing is solid and narration is in third person. At times, TINSELTOWN RIFF does read more like a screenplay rather than a novel and it can frustrate a reader because a scene will cut to a different set of characters and you’re left wondering where it is all going. Though, I will admit Frome has a talent to write as if you’re seeing a movi I just love the cover for Shelly Frome’s TINSELTOWN RIFF! It’s a perfect fit for a book set in Hollywood and about a screenwriter trying to catch a break. The writing is solid and narration is in third person. At times, TINSELTOWN RIFF does read more like a screenplay rather than a novel and it can frustrate a reader because a scene will cut to a different set of characters and you’re left wondering where it is all going. Though, I will admit Frome has a talent to write as if you’re seeing a movie rather than reading a book. One can only hope TINSELTOWN RIFF will one day be adapted and can be seen on screen. He also intermixes a bit of Spanish among a few character conversations. If you’re not fluent in Spanish, don’t despair since Frome does explain what the words mean either right after it’s been said or another character will respond by answering the question. As for characterization, we have a wide array of characters. Ben is the main protagonist and tied very much to the plot, but overall, I don’t feel as if we get to know each character well. Again, this goes in hand with TINSELTOWN RIFF reading more like a screenplay. The ultimate question you might be wondering is, does it work? Yes, it does, but it does slow down the pace. I’ll be honest; I was confused as to who’s who and everyone’s relationship. Truth be told, it doesn’t matter who and what they are; this is a story about Ben and how he never seems to catch a break. I liked him and you can’t help but cheer for the underdog. As for the rest of the characters, they are quirky. There’s Mrs. Melnick whose goal to be on the TONIGHT SHOW WITH JAY LENO then there’s Leo, a Russian obsessed with his visa status. We can’t forget about Angelique who calls the shots, Deke who isn’t afraid to pull the trigger, C.J. the undercover cop who may have dubious plans, and Molly who finds herself caught in the middle. Plus there’s June, the woman who reluctantly raises Ben when his mother abandons him. There are several more characters that make an appearance and play a vital role. I debated with the rating between a three and four. In the end, I went with a three because I felt the pacing was a bit too slow and at times I just couldn’t connect with the novel. Mostly, it comes down to having a large cast of characters and not being able to associate with one in particular. Even though this was Ben’s story, he’s in the background and I wanted to know more about him. The scenes with C.J. and the kids are the best! I loved the interaction and how C.J. was protective towards them. It’s apparent, Frome is familiar with the acting business and he does a great job translating his knowledge to print. Unfortunately, there was just a lot going on and I couldn’t keep up. Overall, Shelly Frome’s TINSELTOWN RIFF was a satisfactory read. While it didn’t work for me, Frome does know how to keep readers engaged. If you’re a fan of action packed novels, you’ll enjoy TINSELTOWN RIFF. I’m looking forward to reading a few of Frome’s backlist since I did like his style of writing. Tinseltown Riff centers on Ben Prine, a thirty-something Hollywood screenwriter who, on a Labor Day weekend, finds himself in desperate straits. Latching on to a dubious last-minute opportunity, he unwittingly embarks on a collision course with a Montana tracker connected with a Vegas mob; an odyssey which culminates in a showdown on an abandoned Western movie set. “Tinseltown Riff" by Shelly Frome, took me on a trip through the movie industry, at least I think it was the movie industry! I had tr Tinseltown Riff centers on Ben Prine, a thirty-something Hollywood screenwriter who, on a Labor Day weekend, finds himself in desperate straits. Latching on to a dubious last-minute opportunity, he unwittingly embarks on a collision course with a Montana tracker connected with a Vegas mob; an odyssey which culminates in a showdown on an abandoned Western movie set. From C.J. Rodriguez, the Hispanic wild surfer undercover cop, to Leo the mad Russian whose visa is about to expire, Mrs. Melnick who will do anything to get on the Jay Leno show, Ray the sleazy front man from Vegas under the gun from the mob, to Angelique, the desperate rock star on the skids, I was totally lost most of the time. Oh, and let’s not forget Molly, the actress wannabe who happens to be a younger version of the desperate rock star, and Deke, the cowboy with a mission and not much conscience. On this wild ride through the industry, you’ll be watching over Ben’s shoulder as he does his best to make it in the Big Time, only to trip and fall, time and time again. What could all of these people possibly have in common with Ben? Read the book and find out. I'm sure you will enjoy it much more then I did. Thanks to the publishers who provided this book to read and review. In Hollywood people will do whatever it takes to finally make it. From Ben, the screenwriter living at his Aunt's house who is out of time, to Angelique the gorgeous blonde who wants to revamp her image to get people to start taking her seriously, to a full cast of other quirky characters. At least I think that's what this book is about, because I didn't quite get it. There is so much that happens in this book, so many characters, and a lot of mystery, that left me more confused than anything els In Hollywood people will do whatever it takes to finally make it. From Ben, the screenwriter living at his Aunt's house who is out of time, to Angelique the gorgeous blonde who wants to revamp her image to get people to start taking her seriously, to a full cast of other quirky characters. At least I think that's what this book is about, because I didn't quite get it. There is so much that happens in this book, so many characters, and a lot of mystery, that left me more confused than anything else. I couldn't seem to get into the story, and since it was hard for me to really pay attention I just got more and more confused the more I read. Unfortunately, this book didn't quite work me. Although I did like the Hollywood landmarks I was able to place and recognize, but overall it didn't work for me. That isn't to say it's not for everyone though, and I think if you're able to follow this better than I, you'd probably enjoy it more. Ben Prine has been living with his aunt for awhile now and she wants him out. She is selling her house and wants to get on with her life. He needs to find a place fast but he has no money and no job prospects. However a screenwriting job lands in his lap all of a sudden but it is a rush job and so steeped in secrets, he doesn't even know what he is suppose to be writing about. It soon becomes apparent to the reader that this job is not what it seems. It just takes Ben longer to discover this. I'v Ben Prine has been living with his aunt for awhile now and she wants him out. She is selling her house and wants to get on with her life. He needs to find a place fast but he has no money and no job prospects. However a screenwriting job lands in his lap all of a sudden but it is a rush job and so steeped in secrets, he doesn't even know what he is suppose to be writing about. It soon becomes apparent to the reader that this job is not what it seems. It just takes Ben longer to discover this. I will be honest it took me a really long time to get into this book and it almost made the didn’t finish pile, but hating to give up on a book I persevered and it did get better. I enjoyed the writing style although at the beginning I really had no idea what the heck was going on as there were too many characters introduced at one time, and I had no idea how they all tied in together and where it was all going, which left me a little frustrated hence my having a hard time getting into the book. I will be honest it took me a really long time to get into this book and it almost made the didn’t finish pile, but hating to give up on a book I persevered and it did get better. * received this free in exchange for an honest review. This book is filled with a quirky cast of characters with a screwball plot. But underneath it has a compelling message. A fun read. Capture Real Energy Reading This Fast Moving and Intriguing Book!